STATE HOUSE – Rep. Teresa Tanzi flew to Washington last week at the request of the White House as a delegate to the first White House Summit on Working Families. The daylong summit on June 23, attended by President Obama, brought together political, social and business activists to discuss policies that can help families and businesses succeed together. “Today, an overwhelming majority of families have all parents working outside the home, but workplace policies haven’t changed to reflect that reality. These are issues that impact everyone at some point in their careers – caring for an aging parent, a sick partner or child, or just needing to be there when your child gets home from school or graduates. Employers should be encouraged to explore flexible workplace policies because empowered employees are productive and committed employees,” said Representative Tanzi (D-Dist. 34, South Kingstown, Narragansett). One of the main policy changes discussed at the event was the need for paid family leave. Rhode Island passed a law last year allowing employees to take up to four weeks’ paid family leave under Temporary Disability Insurance, and became only the third state in the nation with mandated paid leave for people who need to take time out of work to care for a family member. Representative Tanzi noted that one speaker at the summit was a business owner who said that when he changed his business’s policies from a regimented system allowing limited sick and personal days to one allowing employees to take whatever time they needed to take care of themselves and their families, the total number of days off they took decreased. The policy gave his employees the flexibility they needed, while helping his business’s bottom line, he said. 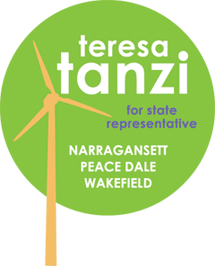 “With greater flexibility – movable hours, paid family leave, maternity leave and sick time, affordable elder and child care – working people with families can succeed at work and at home, without sacrificing either,” said Representative Tanzi.